Colombo, January 24 (newsin.asia): Indicating the existence of close ties between the Sri Lankan Prime Minister Ranil Wickremesinghe and the new Maldivian President Ibrahim Solih, Sri Lanka will have Solih as the chief guest at the 71st Independence Day Celebrations to be held here on February 4. The Maldivian government under Solih has been friendlier to the Ranil Wickremesinghe regime than to the short-lived Mahinda Rajapaksa regime which was installed by President Maithripala Sirisena unconstitutionally on October 26, 2018. Like Wickremesinghe’s United National Party (UNP), Solih’s Maldivian Democratic Party (MDP) had fought for democracy and constitutionalism. Solih who was MDP’s candidate, had defeated President Abdulla Yameen in a bitter battle of the ballot for democracy in September 2018. 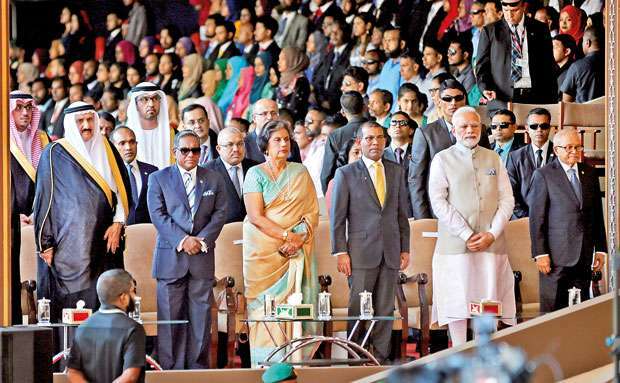 At the inauguration of the Solih regime in Male, former President Chandrika Kumaratunga was among the prominent invitees and was given pride of place. Kumaratunga has been closely connected to the Wickremesinghe regime and had supported him in his fight against President Sirisena. At the inaugural function, the then official Sri Lankan delegation led by Foreign Minister Dr.Sarath Amunugama did not get the pride of place. President Solih had also not responded to a request for an appointment from Dr.Amunugama. Sri Lanka’s Internal and Home Affairs and Provincial Councils and Local Government Minister Vajira Abeywardane said that Independence Day would from now on be known as “National Day” because the Constitution had used that term. A military parade involving 3620 personnel from Sri Lanka Army, 1,249 personal from Sri Lanka Navy, 830 personnel from the Sri Lanka Air Force, 800 personnel from the Sri Lanka Police, 505 personnel from the Civil Defense Force and the 100 from the National Cadet Corps will be held. The National Day celebrations will be concluded with a 25-gun naval salute to the nation at the auspicious time – 12 noon. The government has asked people to keep the national flag hoisted in all government offices, every household and all business premises from February 1 to 7 to mark the National Day. A cultural pageant comprising 865 musicians and dancers and the special parade by Police, Tri-forces personnel along with civil security forces and the National Cadet Corps will take part in the celebrations. Buddhist religious rituals have been organized from February 2 at 9:30 am until 4:45 pm on February 3 at the Independence Square in Colombo 7. An all night pirith ceremony will be held at the Independence Square in Colombo 7.The ceremony will be followed by an alms-giving for monks at the Sri Sambodhi temple in Colombo. Abeywardane said that “Independence Day” has now been re-designated as “National Day” because the Sri Lankan constitution has described the day as National Day. Hindu religious rituals will also take place on February 4 from 06:30 am at the Manikka Pillayar Kovil while Islamic religious rituals will take place on the same date from 6 am at the Jawatte Jumma mosque. Catholics can take part in religious rituals on February 4 from 6:15 am at the Infant Jesus Church in Slave Island while Christian religious rituals will be held on the same date and time at the Presbyterian Church in Colombo 6. Garlanding of the statue of the Father of the Nation, the late Prime Minister D.S.Senanayake will take place at 7.30 am on February 4. Minister Abeywardane further said that instructions have already been given to District Secretariats to make arrangements to organize National Day celebrations at district level except in the Western Province.